Shannon gave me this awesome tiger tee forever ago. I loved it and wore it a ton...that is until I managed to shrink it (or maybe it was always like that and I was blissfully unaware of that fact because I loved the cool tiger graphic.) 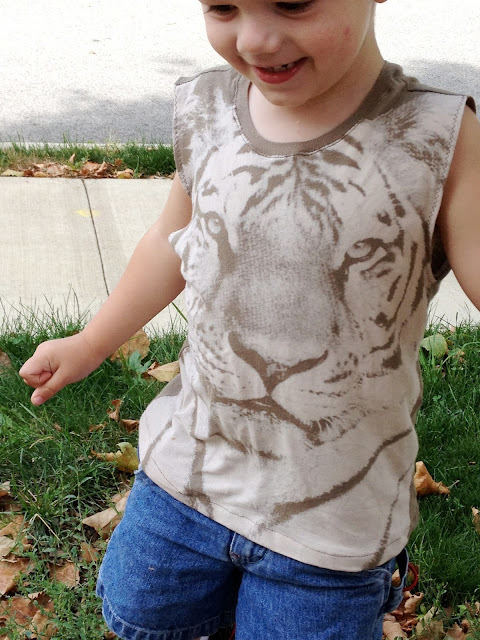 Either way, it was time for me to retire the tiger tee, so it sat in my refashion giant box pile until I rediscovered it and decided that Connor needed this shirt. 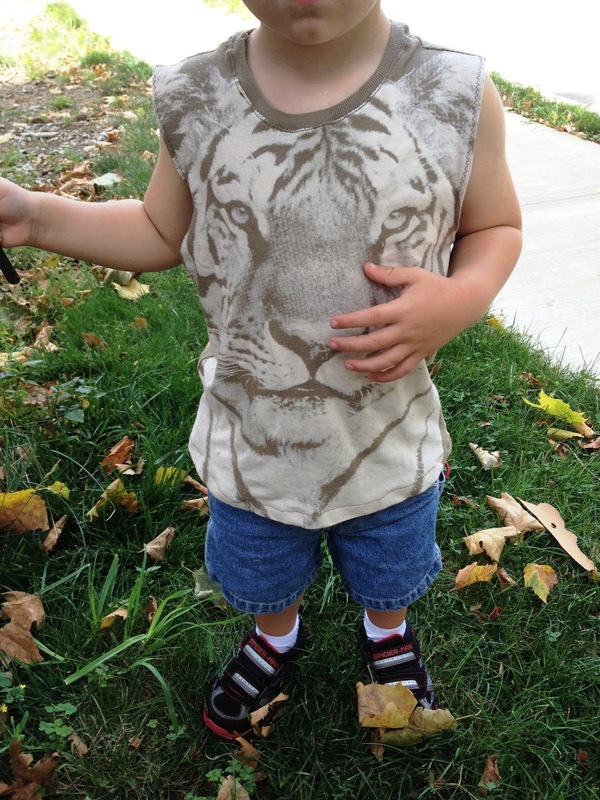 For this tee, I decided to refashion it into a sleeveless tank for Connor. There are tons of great patterns out there that you could use (like Dana's muscle tee) but if you don't have a pattern, no fear. All you need to do is take one of your child's t-shirts and fold it in half with the sleeves tucked in, then trace around the shirt adding 1/2 inch seam allowance, and 1 inch on the bottom for the hem. Boom. Little guy tank. 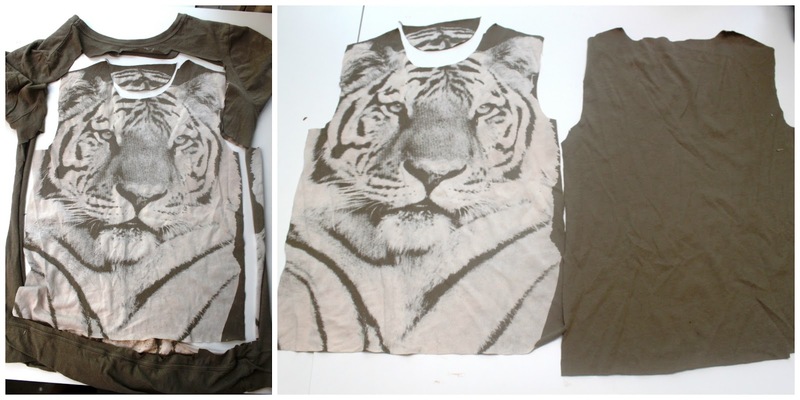 Then it's just a matter of placing your pattern on the t-shirt to be refashioned and cutting out. Then, cut the front neckline a little lower than the back, assemble as usual, and hem your neckline, armholes, and bottom. If you cut out your tank on the existing hem﻿line of your shirt, you won't even have to bother with sewing a bottom hem. 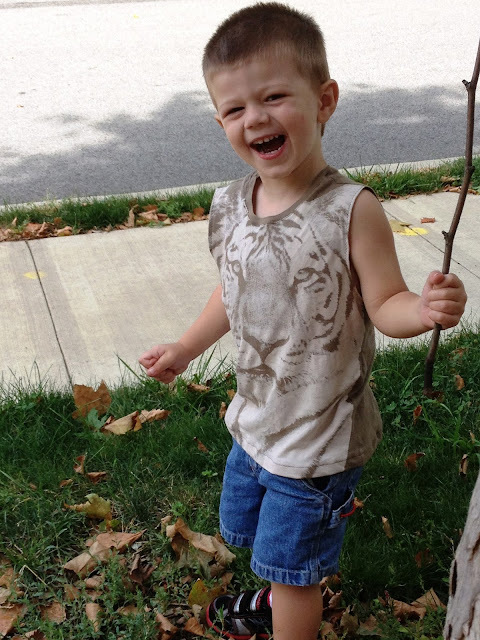 All this kid needs to be happy is a stick. What is it with little boys? They can make weapons out of anything, can't they? And PS, it is extremely difficult to make a 2-year-old stand still for pictures when you're out of M&M's. What kind of fun stuff do you have sitting in your refashion pile? great idea! I usually get rid of the stuff I shrink, but I'll use this next time that happens. So, probably in the near future, haha!